I know I’ve mentioned many times in the past how much I love going to Lansing for work. It’s out of my normal work area which means the company pays for dinner. Last week, a co-worker and I had to run to Lansing for a couple quick tasks. We both wanted to get dinner before leaving town although we couldn’t really come to an agreement on what we wanted. She’s more of a health nut and I like fried foods. I decided to drive through downtown to see if there was something we could agree on. There wasn’t, but there was something each of us wanted, so we split up. She went to Firehouse Subs and I went for fried chicken. 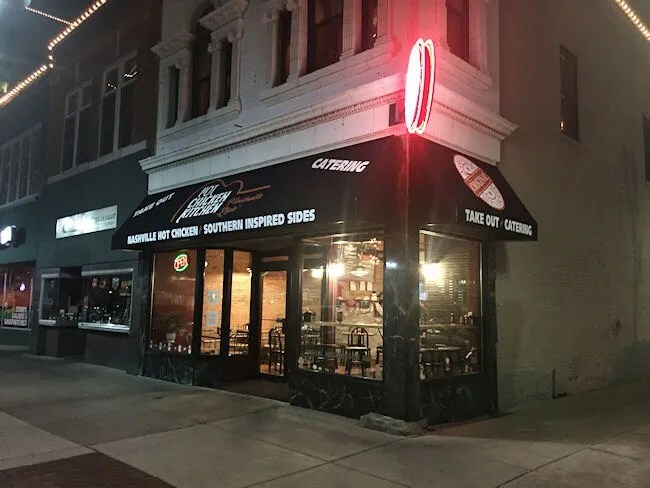 There’s a fairly new chicken shop on the corner of Washington Square and Allegan Street in downtown Lansing called Hot Chicken Kitchen – Nashville Style. 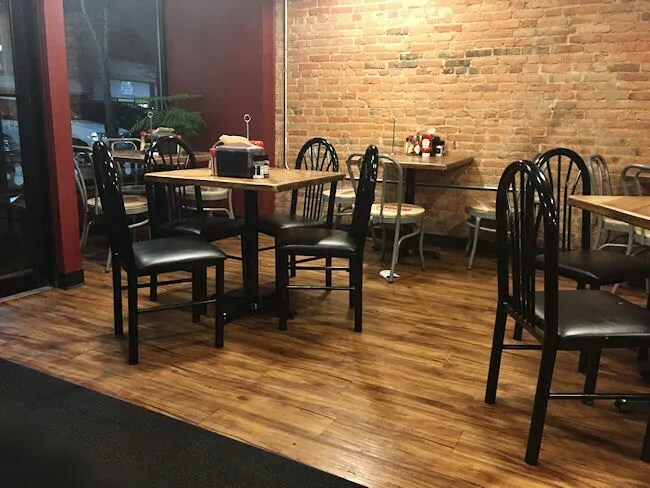 The quick service restaurant takes up the space that was most recently a Tom and Chee. 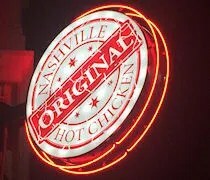 They do a special kind of fried chicken called Nashville Hot Chicken. It’s like regular fried chicken….but it’s hot. The small chain of restaurants only has only two locations at this point…and surprisingly, none of those are in Tennessee. The Lansing location is the only Michigan location. The other one is in Alabama. I noticed they had online ordering while I was looking through their website so I figured that would be the easiest way for me to do things. The big menu item is obviously the chicken. They have four different levels of heat and several different combos of kitchen pieces. If you’re looking for something specific, you can order a la carte and just get the parts of the chicken you like. 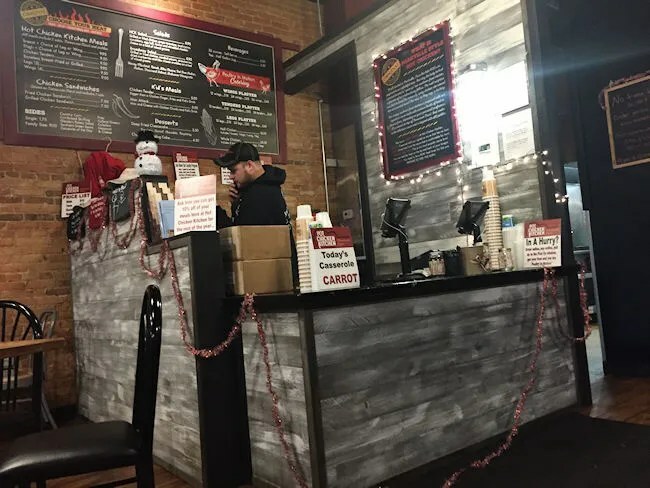 They also have chicken tenders, salads, and a couple of sandwiches to go along with their large list of southern style sides. I put in my order from the car for four wings and a breast with fries and macaroni and cheese. I was sitting pretty much outside the restaurant when I ordered, so when I walked in, the order still hadn’t transmitted. They seemed confused for a second until the order printed itself out while I was waiting there. I had already paid online so I just had to wait for the order to be put together which doesn’t take very long….usually. I caught the kitchen at a bad time. They only had three wings left and no breasts. The cook asked if he could substitute a couple of drumsticks and a wing to make up for the lack of white meat. I said that was fine. He offered to cook me what I ordered, but it would have been a 20 minute wait and I didn’t have that kind of time. 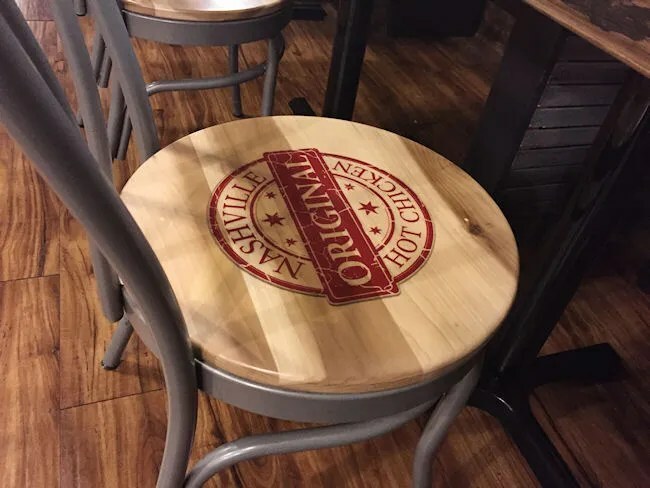 I took a seat at one of the tables surrounded by branded chairs and waited. The place doesn’t look much different than what I remember Tom and Chee looking like. The space has hardwood floors with exposed brick walls. There’s a small dining area with a couple of tables near the front door in front of the order counter and then a row of booths and tables along the outside wall. Even with the confusion over the order being placed and the lack of some of the meat, it still took less than five minutes for my order to actually be handed to me. The chicken isn’t cooked fresh, but this place relies on the speed factor along with the unique flavor to keep people coming in. I couldn’t wait to try the chicken, but we needed to drive back to Grand Rapids. I could tackle the fries in the car and I did just that. They were packed in with part of the chicken (I was given two Styrofoam containers of chicken mainly for presentation), so I kind of rubbed the crinkle cut fries on the outside of it just to pick up a little bit of that heat. 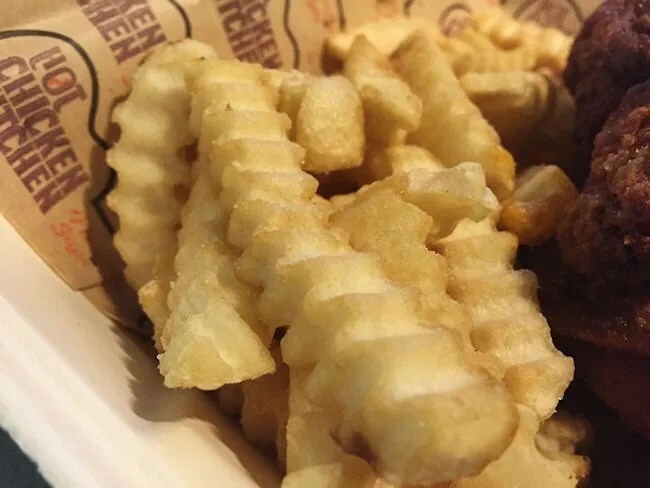 The fries themselves were nothing to brag about, but they are a solid side choice. I like cold chicken better than hot, so it wasn’t a big deal for me to wait until I got back to Grand Rapids before hitting the chicken. I started with the wings because that was the part I really wanted. The wings were stacked on top of each other on top of a toasted slice of Texas Toast with a pickle slice on top. The pickle is interesting because it actually does add flavor to the chicken and it’s not just a garnish. I ripped the wings apart and found juicy chicken beneath a crunchy layer with quick a bit of heat. I went with the Traditional Heat which is three out of four on their scale and it packed quite a punch. I am sort of a wimp when it comes to heat. I used to tolerate it really well, but any more I need a glass of milk with Buffalo wings. This chicken was about on par with the heat of a traditional Buffalo wing but it didn’t have nearly the mess you would get with the Buffalo sauce. This sounds stupid but the part I really, really liked was the Texas Toast underneath the chicken. It was really crispy with a little bit of butter and some of that heat had just soaked in to the bread. I ordered way too much food and ended up sharing some of the dark meat with my co-workers but not before I slid that piece of toast out of the other box where the drumstick and thighs were stacked up and topped with a pickle just like their white meat brethren. The last part of the meal was the macaroni and cheese. It looked, in the container, like bland, imitation cheese sauce that wasn’t going to have much flavor. 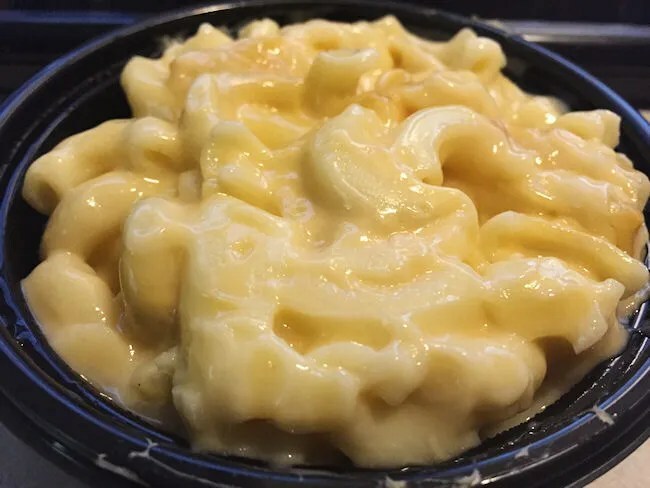 It did have all the tastings of a mass produced macaroni and cheese, but it actually did have a pretty strong cheese flavor to it. The sauce was very thick and very sticky so it clung to the large noodles. It’s not how I would make it at home, but it was actually quite tasty and I finished the small bowl off despite the fact I was already getting full. That should have been the end of the meal, but, due to the lack of wings and breasts, they threw in a deep fried chocolate cheesecake. Somehow, I had never had one of these before. The deep fried part was more of a dough with cinnamon sugar on top of it. 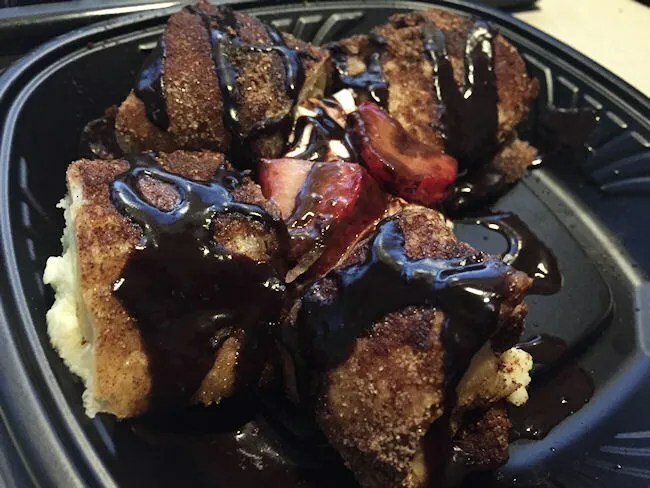 The cheesecake filling was wrapped around the deep fried dough and the whole thing was drizzled with chocolate and topped with raspberries. Again, I was pretty stuffed so I took a few bites and shared the rest with my co-workers. It was an interesting dessert, but I like cheesecake and would probably just stick to cheesecake in the future. The bill for my meal came out to around $15. Hot Chicken Kitchen is definitely a unique concept here in Michigan. 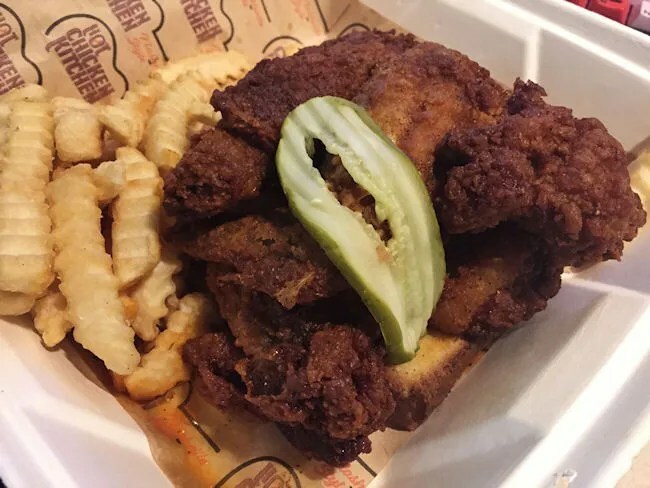 Sure, you can apparently get Nashville Hot Chicken at KFC, but if you’re going to try this Nashville delicacy, why not try it from a place that specializes in it?